Samsung is going to launch Galaxy Grand 2, a 5.25-inch smartphone. 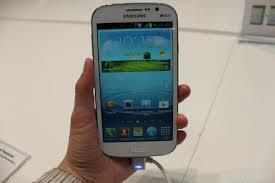 The phone can be described as a mid-range smartphone with a large screen, just like its predecessor- the Galaxy Grand. The HSPA+ device has a 1280×720 TFT screen, a quad-core, 1.2GHz processor, 1.5GB of RAM memory plus 8GB of storage memory, expandable via microSD cards, and an 8-megapixel camera. The dimensions of the Galaxy Grand 2 are 146.8 x 75.3 x 8.9 mm and 163g in weight, which is meant to accommodate a large 2,600 mAh battery. The smartphone comes with dual-SIM slots and Android 4.3. The Galaxy Grand 2 will be available in pink, white and black. Samsung has yet not unveiled the price and exact date of its availability.